Marianne Price: Co-Lead Vocals on "Nothing Lasts Forever" and "Scrapheap City"
We are a few short weeks away from what I hope will be the long awaited and exceedingly merciful conclusion to our nation's endless, nightmarish, through-the-looking-glass-funhouse-mirror version of an election cycle. I have no need to go through the litany of horrors unleashed upon the United States and the world at large via the improbably virile campaign from Donald Trump, whose specialized brand of open faced intolerance for anyone and anything that happens to not be a White male combined with an "Emperor's New Clothes" political agenda tinged with crucial dog-whistle language and coded calls to violence his base has willingly eaten up with a spoon. "Are there any queers in the theater tonight? Who let all of this riff raff into the room? ...I'd have all of you shot!" While clearly mirroring the totalitarians of our past from Stalin to Mussolini and of course, Adolf Hitler who all housed variations of their "final solutions" for humankind, this song was clearly designed as a grim warning for us to not repeat what has already happened and nearly snuffed all of us out. And yet, with Donald Trump, with his overt racism, homophobia, Islamophobia, sexually predatory tendencies, and so much more and all sitting at the edges of his impossibly thin skin and hair trigger temperament, we find ourselves here again. At this time, I wish to turn your attention to an album that I believe has been long forgotten and therefore relegated to the dark basement corners of rock and rock history yet it is a work that I find to be even more chilling, frightening and even prescient than anything within "The Wall." It is an album that I heard for the very first time just a few short years ago and has left me feeling emotionally shattered on each and every listen, And now, it exists as a work that feels to be too terrifyingly close to home. 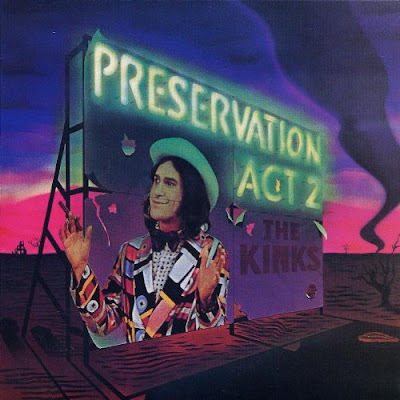 Dear readers and listeners, please allow me to present to you "Preservation Act 2" from the iconic British rock band, The Kinks. For those of you who only know The Kinks' musical history solely through their iconic singles and albums from the 1960's as well as their material from their 1980's resurgence with "Come Dancing," "Don't Forget To Dance" and "Do It Again," The Kinks during the 1970's was a band that was as dangerously and deliriously inventive and innovative as they were restlessly prolific. Since t his was the '70s, concept albums were all the rage and with that aesthetic in mind, The Kinks' principal songwriter/bandleader/producer/guitarist/lead singer Ray Davies took it upon himself to compose a series of story driven albums that never seemed to receive any sort of critical praise but do trust me, as I graciously and passionately urge to you seek them out as they are a collection of wholly unique and idiosyncratic works that often feel like hefty books lined up upon a large bookshelf. For all of the ribald, tongue in cheek high school stage play styled humor, Ray Davies utilized the concept album format to seriously explore a variety of themes including identity, with regards to the urgent necessity for individuality vs. the emptiness of anonymity and conformity, in addition to class warfare in England, the brutality of the British boarding school education (even Pink Floyd's Roger Waters would shudder), the ebb and flow of marriage, fears of humanity being overtaken by impersonal technology as well as the painful adolescent backstory of a character who would wreak havoc over England as a garishly charismatic villain in his adult years. With "Preservation Act 2," we are witness to the full wrath and comeuppance of said villain but it all arrives at a supreme cost to our collective sense of democracy, decency and humanity. The Kinks' "Preservation Act 2" is the grim culmination of the band's musical odyssey which was introduced with the iconic, pastoral "The Kinks Are The Village Green Preservation Society" (released November 22, 1968), began in earnest with "Preservation Act 1" (released November 16, 1973) and even double ended upon itself with a prequel with "Schoolboys In Disgrace" (released November 17, 1975), clearly the only other direction the Preservation saga could turn as "Preservation Act 2" essentially concludes with apocalypse. But I am getting much too far head of myself. Essentially, "The Kinks Are The Village Green Preservation Society" is a beautiful collection of smartly written and wide open hearted collection of vignettes of centering around the lives and pursuits of the inhabitants of the mythical Village Green, which could be seen as a stand in for a more old-fashioned, traditional England or more metaphorically as a tranquil mental space where each of us may be able to travel that is far away from the noise of the world. "Preservation Act 1" more or less continues within this vein of vignettes yet a more formal plot begins to creep into the proceedings. Selections like "There's A Change In The Weather," a song in which restless citizens begin to hold individual premonitions concerning potential dark times ahead.as well as "Money And Corruption/I Am Your Man," "Here Comes Flash" and "Demolition," all begin to set the full plot in motion as these tracks detail the arrival of the insidious gangster Mr. Flash, who cons the citizens of the Village Green, purchases the land and destroys the English greenery transforming it into what is eventually described as a "vulgar playground" which exists completely under Flash's control. With the double album rock opera opus of "Preservation Act 2," The Kinks take us into political warfare, a battle for ultimate power and control between the garish Mr. Flash and Mr. Black, the conservative yet frighteningly duplicitous figure who volunteers himself to take down Flash but who also houses a secret and horrifying endgame for all of the citizens. The album opens with impending chaos as one of the album's occasional news bulletin reports that a new "People's Army" formulated by Mr. Black has been rumored to have been formed in an attempt to overthrow Mr. Flash and his minions. "Introduction To Solution" depicts both villains in their separate quarters, plotting against each other as they each "debase life with crude ostentation" while "the poor cry for more." And in the eyes of the character known only as The Tramp, a stand-in for all of us listeners, the common people, the pawns in Flash and Black's political chess match, he sadly sighs, "I'm only standing here/Watching it all go on, and I'm watching it all go wrong/And it's painfully clear that the battle is near/And I wish I could just disappear." Meanwhile, in an attic somewhere in suburbia (according to Ray Davies' own stage directions), we find Mr. Black in sinister soliloquy with the song "When A Solution Comes." Over a bed of warm acoustic guitars and electric piano yet pushed by plodding drums, Mr. Black reveals his fascistic ambitions over the unsuspecting Mr. Flash and the Village Green as a whole. He speaks of achieving "revolution" with his specialized "final solution." I'm gonna build a new civilization"
With a level of raw rock and roll sleaze that truly outdoes The Rolling Stones at their best, we arrive next with the raucous "Money Talks" where we find ourselves with Mr. Flash and his Spivs and floosies reveling in their amassed wealth and gleeful corruption. "Money can't breathe and money can't see," sings Flash. "But, when I pull out a fiver people listen to me." Yet, as a contrast to Flash overt vulgarity, Mr. Black and his growing army addresses the nation with a plea for a return to a certain conservatism with The Kinks' stab at Monty Python-esque satire in "Shepherds Of The Nation." And as expected, the people swallow the bait. Yet, for Flash, we re-visit him and his gang through the Gilbert and Sullivan styled "Second-Hand Car Spiv," on which we explore the class warfare that produced figures like these and the sense of self-justification they feel towards themselves and their vicious reign of power. Even so, there is a Falstaff-esque tinge to the admissions from Flash in "Scum Of The Earth," on which he proclaims, "So don't put me down because I've done well.../we're your enemies and your brothers/And no man is a saint/And deep down we're all the same as one another." The spectacular "He's Evil" could initially be seen as being directed toward the insidious Mr. Flash but upon further examination, I am feeling even more that this is a song designed as conceptual foreshadowing as well as a warning to the people over the true motives of Mr. Black, . Even Mr. Flash, who has been seen to posses a certain dark charm is taken to task by his main squeeze Belle in he burlesque, New Orleans stomp of "Mirror Of Love," which showcases her attraction and love for Flash although he's a "mean and obscene lover." At the album midpoint, another news bulletin informs us of Flash and Black's war taking to the streets in increased violence and fury with the people powerless to stop it. With the six and a half minute "Nobody Gives," The Tramp returns to the scene with a world weary lament that explores political, and therefore, human conflicts and tragedies of the past (most specifically, 1926 and 1939), which in turn provide parallels to the turbulence of the Village Green as caused by Flash and Black and the impending, inevitable genocide. Why can't we sit down and work out a compromise? Why not negotiate and try to be civilized? Nobody listens and no one will understand"
As The Tramp continues to voice his pleas with the aching ballad "Oh Where Oh Where Is Love?," Mr. Flash is caught within his own crisis of conscience as he is confronted with the voice and being of his own soul in "Flash's Dream (The Final Elbow)," who takes him to extreme task for his evil-doing as well as provides him with the stern warning that his time is coming to a swift and unmerciful end...literally. Waking in fright, Flash voices his full repentance in the swirling darkness of "Flash's Confession," after which, he views his life with a newfound sense of resignation alongside Belle in the tender ballad "Nothing Lasts Forever," before he is soon overtaken by Mr. Black's forces, captured and delivered to Black's lair. At this point, "Preservation Act 2" flies in to the surreal and nightmarish with the "Rocky Horror Picture Show" styled "Artificial Man," on which the fullness of Black's plans are revealed and Flash is his first victim. "I can't believe this is happening," Flash protests. "I just want to stay the way that I am/I don't want to live a lie in an artificial world." Mr. Black, however, gleefully continues to make Flash his test case as he murders his adversary, cleanses his brain and essentially creates a mindless robot who will forever be monitored and controlled by Black's new regime. To live within our artificial world"
Feeling that he has finally discovered how to "improve upon God's creation" for upgrading the "outdated homo sapien," Black's plans for the downfall of humanity are complete as he slaughters his opponents and all those who conspire against or even question his authority. And even still, he doesn't stop there. On the country and western tinged "Scrapheap City," Belle, before she is also soon taken away to be transformed into an automaton, observes the destruction around her as the Village Green, and humanity itself, reaches it end. "Preservation Act 2" concludes with a final news bulletin informing the public that remains of a new "State Of Emergency" that is indefinitely in place due to "government security." New curfews, fully enforced by Black's ironically named People's Army, are now in place as are rationing of food, gas, water, electricity and even operating businesses. Places of public entertainment and all television stations have been forced to close and the dissemination of news has now been filtered to one, solitary government run radio station on which blares Black's newly composed National Anthem entitled "Salvation Road." As we walk down Salvation Road"
And so, under Black merciless control, the human experiment concludes as does The Kinks' "Preservation Act 2." As I stated at the outset of this posting, The Kinks' "Preservation Act 2," in my mind, is a bleaker and much more brutally uncompromising rock opera/concept album than many others that I have heard before, and that, again, includes Pink Floyd's "The Wall." Unlike the Floyd epic which concludes with the track "Outside The Wall," a song suggesting a greater sense of connection after intense isolation, and the possibilities of community after crippling solitude, The Kinks, by contrast, offer no such escape hatch. It is an album of darkness and despair throughout and over the course of its four sides, the level of dissolution and destruction only increases, all leading to the point where all sense of connection, community, and individuality itself, warts and all, have been snuffed out. There is no glimmer of hope. There is nothing within the work that even gives the listener something to cling onto by album's end. With this album, The Kinks have given us the end of the world which they race towards uncompromisingly and yet with the fullness of heart and anguish for the human race doomed to undo itself for nothing more than power, control and an unforgivable level of self-preservation for the self at the expense of all. Now this is not to say that there is no fun, so to speak, to be had while listening to the album. Quite the contrary, the joyous pleasures of such a disturbing release as this one is are completely found within The Kinks' full throttle creative fearlessness as this particular decade was especially fruitful even if it was confounding for their fans, critics and the public at large. I do realize that the band completely marginalized themselves to a degree since not everyone enjoys double albums, concepts albums or rock operas, all three very uncool things that I do happen to enjoy tremendously for I love losing myself within an album--and if there are musical peaks and valleys and conceptual narrative to aid in the experience, then so be it. And besides, it would be hard pressed to find a leader as adept as Ray Davies to steer the conceptual shift, one who wished to try his hand at being a rock and rock dramatist over and again, and as far as I am concerned, to a most provocative degree. Honestly, it seems as if the man worked himself to exhaustion and beyond during this era and on this album in particular. To craft a narrative would be well and good enough but one that contains actual songs than crossed boundaries from the intimate to the epic, that carried the banner for full-on rock and roll power but mixed with musical theater, near dixieland jazz, political blues and balladry that not only showcased his gifts for music, lyrics and melodic dynamism but for an overall human outreach that was precisely aware of how and where the human race could possibly be headed should we not attend to ourselves with extreme care. Davies, with The Kinks, created an album of the past, which pointed towards an impossibly dark future...but a future that is more than possible in 2016 for it truly has arrived. As you may already know, I am based in Madison, WI, my adopted home for nearly 30 years and I first heard "Preservation Act 2" after the regime of Republican Governor Scott Walker began it tenure with an extremist ideology that has rolled back 100 years of Wisconsin based progressive politics and policies in a scant five years--and to such a degree I would imagine it would take decades to even try to right all of his extreme wrongs, which have included (but are not limited to) a disastrous amount of jobs steadily leaving the state, the slow decay and destruction of public education from preschool through college (I believe solely his revenge for not obtaining a college degree of his own after having been rumored to have been expelled), a complete disregard for women's equality (from his ending of the Equal Pay Act to government enforced trans-vaginal probes in order to shame women from choosing abortion), the dismantling of the non-partisan Government Accountability Board, the implementation of classict and racist Voter ID laws and even the illegal arrests of 1st Amendment protected citizens for SINGING protest songs within the State Capitol. All of this plus the fact that he was the primary subject of a criminal probe for illegal campaigning acts but as he and his cronies have re-written laws, they have now legalized their own acts of criminality which they can now be no longer investigated for. To think, his career as Governor came to be not just through a miserable voter turnout by liberals (for liberals are often their own worst enemies) in 2010 but also through a carefully cultivated public image he crafted to a non-committed, uninformed public which presented him as a casual, clean cut, conservative God fearing figure with old fashioned Midwestern values who supposedly carried a brown bag lunch to work every day. Mr. Black indeed. But now, our nation is overrun with figures just like Walker, many of whom are members of the Tea Party Obstructionist Congress who have ground our political discourse to a screeching halt due solely to their unabashed racism towards President Obama over these past eight years. And now, I look at the national stage and remain stunned that no one seems to remember our human history, eve one as RECENT as the Holocaust when I see the daily atrocities performed by Donald Trump, a figure the Republican party fully gave birth to and fully owns despite their efforts to run as fast and as far away from him as they are able. Yes, Adolf Hitler comparison are generally easy and lazy but watching Donald Trump and the rhetoric contained at his vicious, vitriolic and violent rallies have given me the greatest pauses of my life and honestly, I have never been more frightened than I am right now. Within "Preservation Act 2," Mr. Black's schemes may seem to be fantastical or even a bit silly within this rock an roll context and the idea of changing humans to robotic Master Race but Ray Davies was truly onto something all the way back in 1974...something that is fully playing out to extremes in 2016. In fact, I cannot help but to wonder if Davies himself is looking at our political landscape these days and sadly shaking his head as he did know this was a distinct possibility for us all along. We have been here before as a species and even though fights long fought are playing out passionately again, we must remain vigilant to the purity of ourselves, a message I wonder if "Preservation Act 2" is imploring of all of its listeners. Trump is a dangerous, despicable man. A figure who is so uninformed, so unrepentant in his overt sexism, racism, and criticism of any and all who do not fit into the greatness of himself which he has projected into his own cranium on an endless loop. A person with no moral compass or objectivity. No sense of logic, compassion or reason but so shockingly thin-skinned that he is prone to all imagined conspiracies that are unleashed after any slights towards him, no matter how small. As he has received endorsements of support from White supremacy groups, none of whom he has denounced, his stance to "Make America Great Again" and his pledge to become the "Law And Order President" in this age of Black Lives Matter and rampant Islamophobia are examples of coded language that has made me more afraid than ever for my personal safety for no other reason than the color of my skin. He is garish, crude, lewd and bombastic. He is the embodiment of uncontrollable White male, fear, entitlement and rage unleashed. He is Mr. Flash and Mr. Black all rolled into one. And as in the words of The Kinks' song itself, he's evil. With about two weeks remaining before election day, I hope that the universe's pendulum of justice is able to swing in the way of humanity once more as these past few years, and this point in time crucially, The Kinks' 40 year plus old album have become so frighteningly prevalent. As Flash's soul speaks to him shortly before his demise, it explains profoundly, "Men like you will always come and go, but the people will go on forever." I love the "Preservation Act" in its entirety and especially the jewel (Preservation Act 2). It's from my favorite albums, not just from The Kinks but from music in general. Hi there!!!! Thank you so much for taking the time to read this posting. I greatly appreciate it. Yes, as you can gather from the posting, I completely agree with you. It is such a great album and it amazes me that it has been essentially ignored and somewhat forgotten. Thanks to you, Scott Collins! For believing in my modest opinion in Ray Davies' most ambitious work of his entire career, taking into account from the base of the Village Green Preservation Society extending to "Preservation Act 1" to the summit and culmination "Preservation Act 2." In my opinion it did not work. First-because even in their time of splendor they did not sell what they owed and had ridiculous sales. Second - conceptual discs are not very well seen by the critic or the public. Third - because it was a very extensive work and to say, that the last album was a double album. Fourth - It was not a work of Hits songs, nor of songs loose and nor was made to expose them in the radio. It was an Operetta !!! And not a conventional album. Thanks again and regards!! !